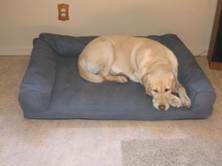 Kj’s Orthopedic Memory Foam Bolster Beds are designed to provide comfort for the lifetime of your pet! The “arms and back rest” will protect the walls, and contain the hair and dirt that falls off Fido. This means ease of maintenance! Made with easy care fabrics, to complement your décor! Dogs just love to snuggle against and rest their head on the bolster, while the memory foam contours perfectly, providing the ultimate cushioning for large or older dogs.. This even support prevents compression points that aggravate orthopedic conditions. (such as hip or elbow Dysplasia and canine arthritis) We combine a layer of memory foam with a support foam based on your dogs weight. We also customize the height of the bolsters, and dimensions to fit your pet. We designed this style to be low to the ground for ease of entrance. Softly Sueded Vinyl which will not absorb moisture or smells, thus you don’t have to remove the cover to wash it... ever. Cleaning involves just a simple wiping of the surface with mild soap and water! Available in 3 types of sueded vinyls and each has 15 colors. That means 45 fabric choices. *Another highly recommended choice is the sueded, pile or boucle’ textured .Crypton® Super fabrics These are exceptionally durable and breathable polyester fabrics . The fibers of Crypton fabric resist moisture, and soiling so well washing is rarely needed Easy Care! If needed, they can be cleaned with water extraction method, or gently cleaned with Tide. We also make those fluffy berber slipcovers if you prefer to launder your covers.